Well, at least it's Lei Day in Hawaii, where I'm not! Wish I was though. I said yesterday, we'd be heading out this morning. OK, so I lied . 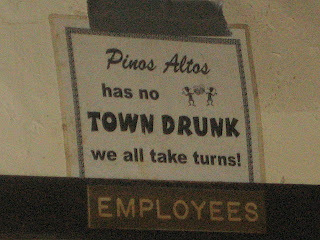 . . we didn't get out of town today. The wind is again blowing like crazy, gusting to up to 65 MPH. Much as I wanted to get on the road, I'd be nuts to drive in this stuff. Had to change a couple reservations, but hopefully we can drive on tomorrow. Cross your fingers please! As usual, I’ve fallen behind – for one simple reason! We’re having a grand time!! Today we simply drove around the area, taking it easy and enjoying the countryside. 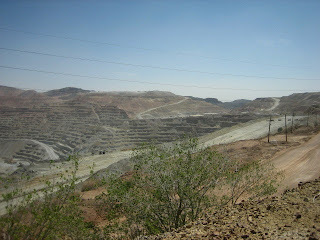 Went out to take a peak at the immense Chino open-pit mine copper mine. 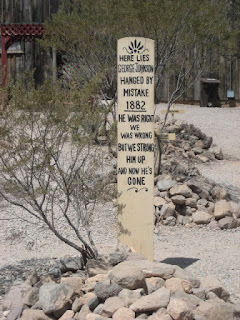 This was once the largest in the world and is perhaps the oldest mining site still being used in the American southwest. 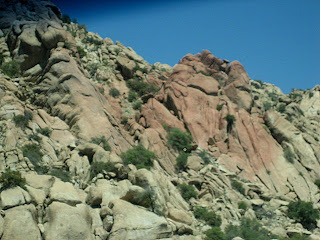 Apaches, Spaniards, Mexicans, and Americans have all obtained native copper and copper ore from this site. 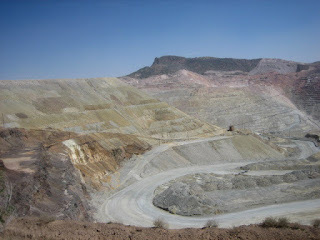 It’s now the third oldest open pit copper mine in the world after the Bingham Canyon Mine and Chuquicamata. 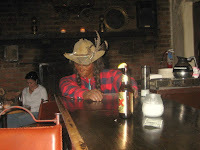 We enjoyed roaming the streets of Old Town, but I have to say – it’s not like Old Town Sante Fe. 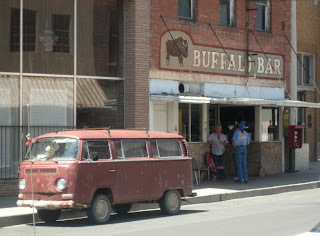 We saw a couple cute shops and one very proper bar, The Buffalo Bar, but that was about it! I do like the area – and it’s in a beautiful setting. Plus, we've eaten very well! Lunch was at Isaacs and was excellent! I had a buffalo burger to die for, and Sooz had a fresh shrimp salad that made my mouth water across the table! Plus their “famous” duck fat french fries, which are, as stated, cooked in duck fat. The very best fries I’ve ever had!! The balance of the day, we took it easy. The wind is howling – and you may have seen on the news that there are a couple fires running wild near Albuquerque. Thankfully, we’re heading west in the morning! 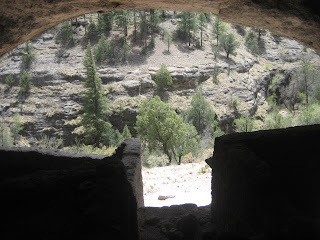 This gorgeous day took us up the road to the Gila Cliff Dwellings – a spectacular example of the incredible workmanship of the old people. 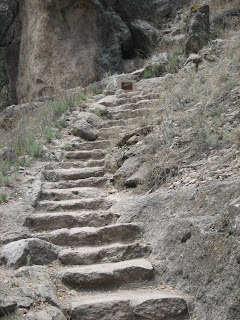 As they say, more questions than answers surround the story of the people who built these structures in the natural caves in what is now called Cliff Dweller Canyon. Evidence suggests that many different groups have inhabited this area over thousands of years, beginning in the late 1270s. 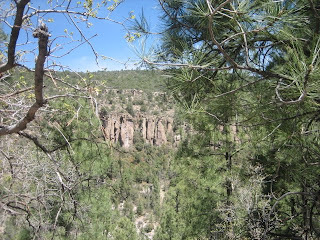 They were part of the Mogollon culture, who combined hunting and gathering with farming and traditionally built pit houses. 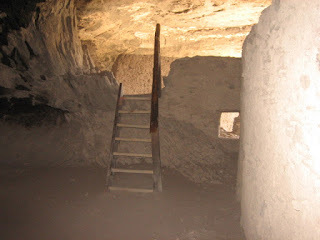 The Tularosa Mogollon broke with tradition to build inside the caves with rock, mortar and timbers. But by 1300, they had moved on. No one appears to have lived in the area for more than a century. 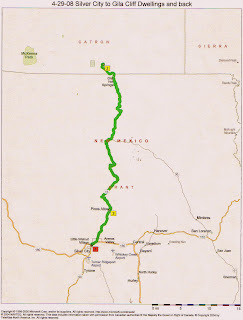 Apaches migrated in about 1500, and legendary Geronimo was born near there in the early 1820s. 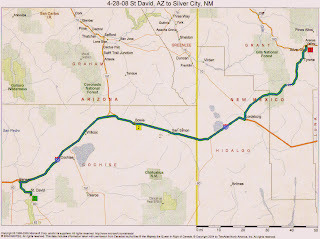 A chance prospecting trip by miner H.B. 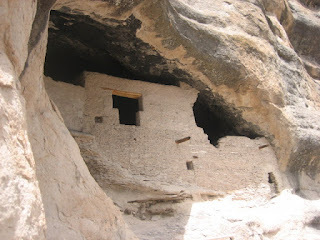 Ailman documented the cliff dwellings and when archeologists arrived to study the site in 1884, the site had already been looted by earlier visitors, who took many artifacts and obliterated much of the archeological record. In 1907, Teddy Roosevelt proclaimed it a national monument to prevent further damage and vandalism. 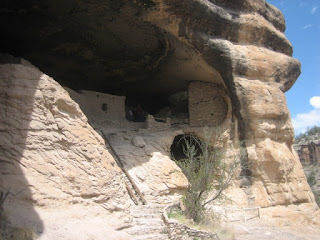 The road in and out from the Cliff Dwellings is two-lane, curvy and beautiful. We enjoyed the trees and the pine scented air and the birds and one little squirrel who waved at us as we drove by! 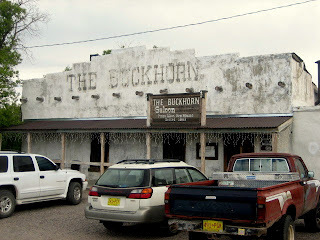 and had dinner at the most elegant restaurant in town – at least inside – the Buckhorn Saloon . . . with the best steaks in the West! I’ve been there before, and just had to share it with Sooz! Sadly, there was no music this night – the first time I was there, old Minnie Pearl was entertaining – at least a very good likeness of her! It’s a place no one should ever miss if passing anywere near here!!! into New Mexico we go! 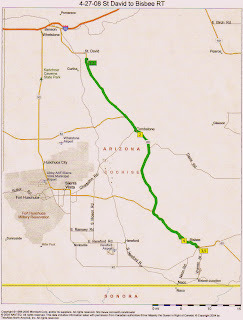 Left the lovely St. David park for a nice easy drive thru the wide open spaces of the West – rolling hills, grass, scrub mesquite, lots of yucca in full flower. Lovely day. Surprised Sooz with the sudden change in the countryside at the Dragoon Mountains. 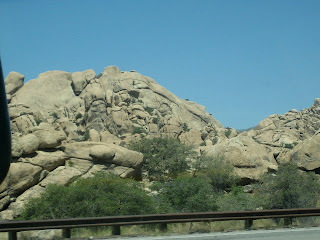 The great big rocks piled one on town of the other. A very powerful eruption in the middle of nowhere, and then just as suddenly, it’s gone! 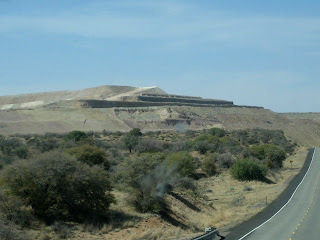 Lots of mines in this neck of the woods - this one, the Tyrone Mine is just south of town. Arrived at the Silver City RV Park in the heart of the city. Nice park run by a delightful gal named Gloria, who went out of her way to help us when we found we had a propane leak. There is no such thing as a mobile mechanic here, so she called a friend of the family who runs a propane business. He came right out and solved our problem. No satellite signal here either, but at least the local TV stations came in clear enough for us to enjoy “Dancing With The Stars”!! What a fun day! 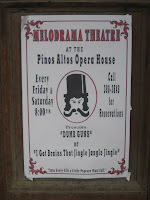 We headed south about 15 miles to Tombstone, to find it absolutely chock-a-block with tourists. 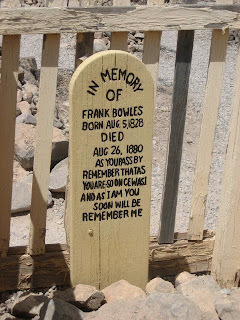 We made the obligatory stop at Boot Hill, which I never miss when I have visitors in tow. 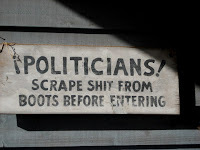 Every time I wander thru, I find they’ve cleaned it up a little more, made signs more legible, almost to the point that it’s lost some of it’s charm. But I still love it! 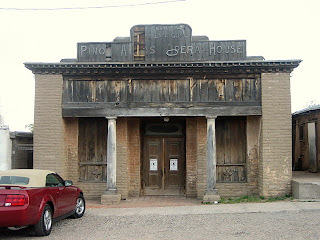 We decided to go down to Bisbee for lunch, rather than deal with all the tourists. 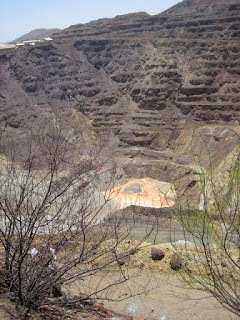 Drove thru the rolling hills into the mountains holding many mines, and Bisbee and it’s enchanting Copper Queen Hotel and the huge open pit mine. The city has always held a place in my heart – it’s lovely. Built onto the steep hills around the mine, stair climbing the hills to get from level to level. Thank goodness, the bars and restaurants are on the lower level! We met up with Annette (from Amado and then Kino Bay!!) 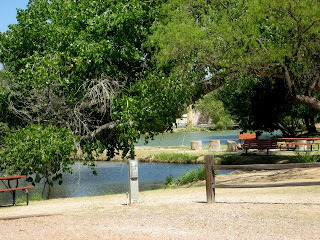 at the darling Shady Dell RV park, with Dot’s Diner. 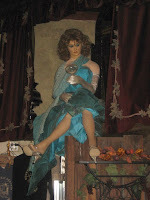 But we decided to splurge and had a delightful lunch on the patio at the Copper Queen. 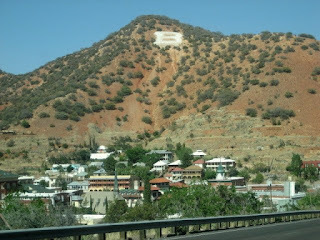 Bisbee almost died when the mine closed, as so many towns do, but received an influx of money and hope, and has undergone a facelift, returning to its earlier glory! 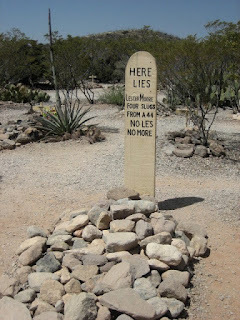 We decided to take another pass at Tombstone on our way back to the RV Park. This time the town was almost empty. 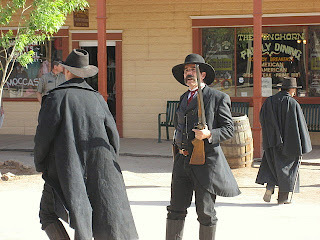 We arrived just in time to see the Earp brothers confront several bad guys on the street, which was fun. 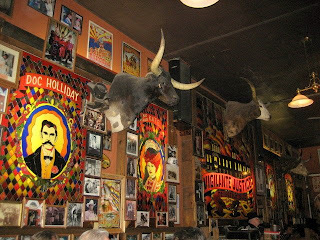 We wandered both sides of Allan Street and stuck our noses into Big Nose Kate’s Saloon, where a darling old man was singing old country songs (and new ones) with a great Johnny Cash type voice. Stayed a little longer than we had intended. What a surprise!